We’ve been working on our own version of the ‘engage-disengage’ game. (If you want the longer explanation with examples of the engage-disengage game, read my post titled Look at her now! ) Today, Sasha added her own twist. Once Sasha disengages from barking at an approaching dog, I verbally “click” and treat. Ironically, we haven’t encountered many dogs while walking in the past few weeks, so Sasha apparently decided a creative adaptation was needed. On today’s walk she paused, barked briefly–at nothing I could see–and then looked at me for her treat. She then proceeded to test her “bark followed by no-bark gets me treats” strategy by responding to dogs barking behind fences, dogs in houses, and (being an equal opportunity barker) at two kittens dozing in the sunshine across the street. One thing’s for sure: training is never boring where Shelties are concerned! 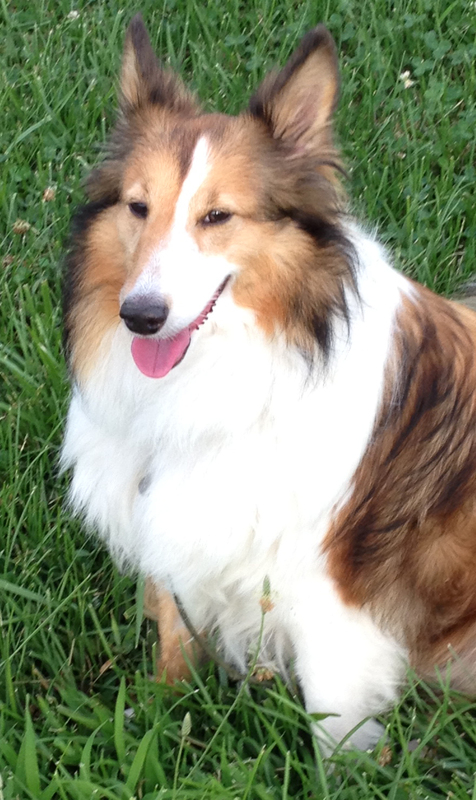 This entry was posted in Dogs, Home page, Training and tagged dog treats, Dogs, Engage-Disengage game, Ozark Summer Highlands Sasha, Shetland Sheepdog, Training. Bookmark the permalink. ← Look at her now! Shadow and Sasha have us well trained! That is too funny! It gave me a good laugh. Smart girl! It’s never dull during our training sessions! Ha, ha! How cute! You have trained Sasha to bark. Not my intention, but it sure looks that way! OMG, Katie does this too! We used to give her a treat if she’d stop barking when she was getting all hysterical barking out the windows at whatever in the back yard. Now she runs to a chair, jumps up, barks once or twice, then turns and grins at us and rushes over to get her “stop barking” treat. Brilliant! Shelties are so clever, it doesn’t matter how you try to ‘win’!